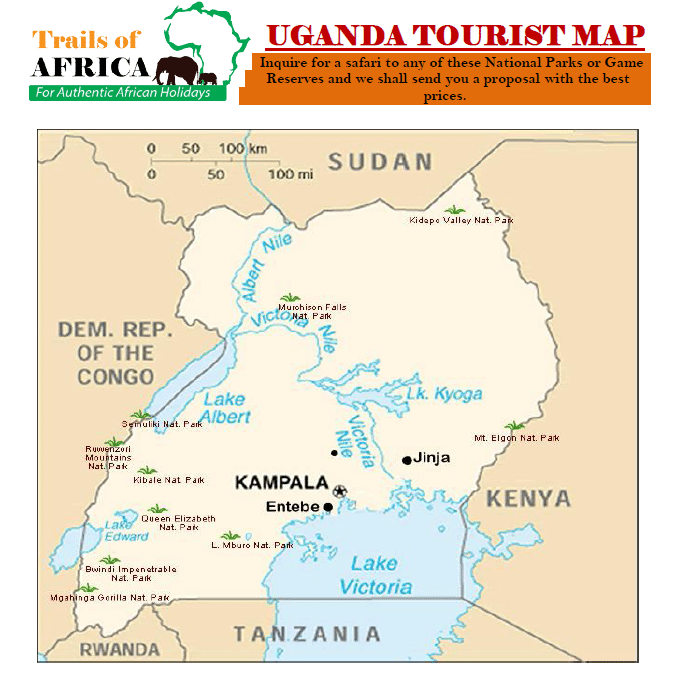 Day 3: Murchison Falls National Park. Enjoy an early morning game drive enabling you to see the Giraffe, lions Elephants, Oribi, Bushbuck, Bohor reedbuck hyena, the leopard and a three hours launch trip in the afternoon after your lunch, allows you more bird watching of species like the shoebill and animals like: – crocodiles, hippos and elephants, before retiring to your camp for overnight.Overnight at RedChillie Safari Camp (Camping Ground) booked on Full Board: Lunch/Dinner/Breakfast. After breakfast, depart for Kibale forest national park through Hoima with a lunch stop at Hoima Kolping hotel then proceed to Kibale arriving at your hotel for overnight. Kibale is home to a remarkable 13 primate species, including the very localised red colobus and L’Hoest’s monkey. Major attraction, however, is the opportunity to track habituated chimps – these delightful apes they are tremendous fun to watch as they squabble and play. 335 species of birds have been recorded here.Overnight at Chimpanzee Guest House (Camping Ground) booked on Full Board: Lunch/Dinner/Breakfast. Leave Kibale to Queen Elizabeth National Park in the morning via Kasese town and enjoy the views of Mount Rwenzori (Mount Rwenzori is the highest mountain in Uganda with an altitude of 5109 m also known as mountains of the Moon). You will then proceed for a boat ride to Kazinga Channel. Queen Elizabeth National Park has over 95 mammal species (among them elephants, lions, leopards, kobs, buffaloes, jackals, spotted hyenas) and 10 primate species, like chimpanzees, velvet monkeys, blue monkeys, red tailed monkeys, black and white colobus, olive baboons. The listing of birds is of 606 species entered.Overnight at Simba Safari Camp (Camping Ground) booked on Full Board: Lunch/Dinner/Breakfast. Early morning Tea/coffee at 6:30am before proceeding for a game drive in Kasenyi area; an open savannah area full of elephants, buffalo, warthog, baboon, lion, leopard, several monkey species, spotted hyena, Uganda kob and bushbucks. Return for full breakfast and transfer to Bwindi Forest National Park. Lunch will be enroute. Arrive at Bwindi in the evening for dinner and overnight.Overnight at Buhoma Community Bandas (Camping Ground) booked on Full Board: Lunch/Dinner/Breakfast. After breakfast you will receive the daily briefing from your guide before you leave for the forest for gorilla trekking. Once the gorillas are spotted, you shall return to the hotel for lunch. Afterwards, enjoy afternoon guided village walk to learn more about the communities around the Bwindi Park.Overnight at Buhoma Community Bandas (Camping Ground) booked on Full Board: Lunch/Dinner/Breakfast. Early breakfast and depart Bwindi gorilla National park for Kampala. Lunch shall be served enroute and just in case you need souvenirs then you will have an opportunity to stop at the equator.